Head away from the city and back in time with a Napa Valley getaway that explores its historic side of this vibrant city. Cross beautiful San Francisco Bay by ferry to an elegant train ride through breathtaking vineyards. 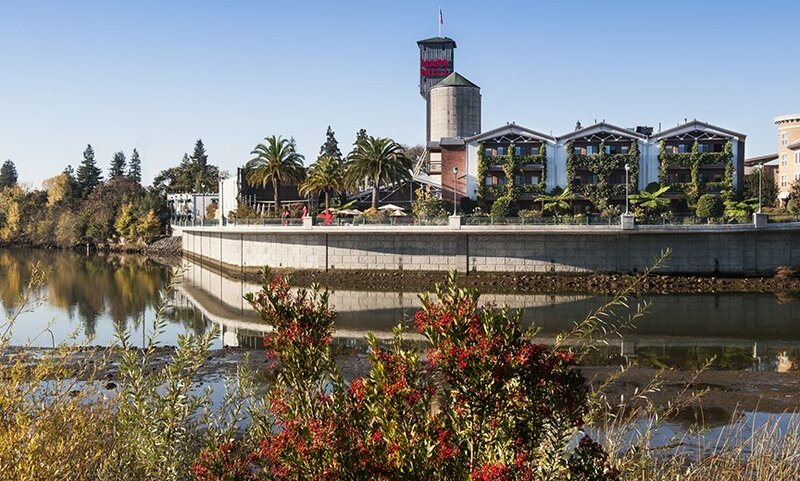 Your journey is capped off with a stay at the distinctive Napa River Inn at the perfectly located Historic Napa Mill. Step away from San Francisco’s bustling waterfront on a Wine Country journey just one hour north of the city, but into a welcome change of pace. Slower, more relaxed, but there’s nothing sleepy about this trip. Leave your worries—and your car—behind as you make your way to California’s breathtaking wine region, a stay at the world-class Forbes Four Star Napa River Inn, and a one-of-a-kind exploration of the surrounding valley aboard the luxurious and elegant Napa Valley Wine Train. The Napa River Inn’s waterfront location within the Historic Napa Mill puts it right in the heart of the bustling renaissance of Downtown Napa’s Riverfront District. Downtown Napa’s highest Michelin rated, and Forbes Four Star hotel, the Napa River Inn offers exceptional service, four award-winning restaurants, premium wine tasting, on-site shopping, live jazz music at SILO’s Jazz Club, and rejuvenating spa treatments at The Spa at Napa River Inn. *This package is good Sunday through Thursday only. Gratuities and hotel taxes not included in the package price. Weekend rates and rates without Transportation are available. A two-night minimum may apply. Please contact the Napa River Inn for details. Arrive at the San Francisco Ferry building. With the Wine Train's Ferry Connection, take the ferry from San Francisco to Vallejo. Arrive in Vallejo. A shuttle will be waiting to transport you to the Wine Train Station. Check in and leave your luggage with the Wine Train's reservation agents and enjoy some time to shop at the Station before boarding the Wine Train. Check in for your gourmet lunch dining journey aboard the Wine Train. Train returns. Ask the Wine Train staff to call the bellman from the Napa River Inn. Check in and enjoy a relaxing afternoon or rent a bike to see the sights. When evening falls, dine at one of our many downtown restaurants. Enjoy a gourmet (and very delicious) breakfast from Sweetie Pie's Bakery in the comfort of your room. It's time to discover Downtown Napa. Savor a wine tasting at the various tasting rooms, explore the downtown murals, the river walk, shops, and art galleries. The Napa Premium Outlets are a short cab ride away from the historic downtown. Then check out of the Napa River Inn. Arrive at the Wine Train Station to take Shuttle to Valley Ferry. Ferry back to San Francisco.